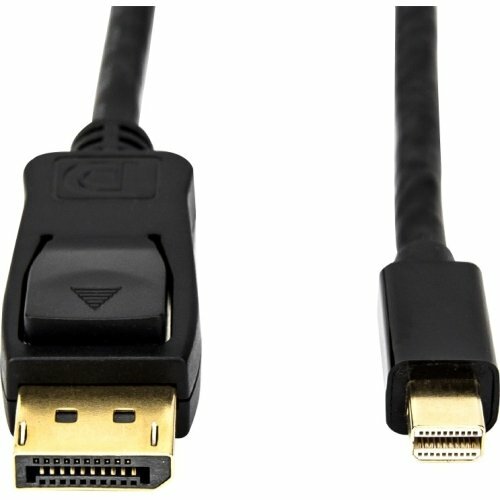 The Rocstor premium 6ft (2m) Mini-DisplayPort 1.2v to DisplayPort Cable offers up to 4K resolution in a cable solution for connecting to Mini-DisplayPort enabled computer to a DisplayPort - equipped monitors or high definition TVs. The Mini DisplayPort to DisplayPort cable from Rocstor enables you to view video content from any desktop or laptop with Mini DisplayPort video output on a variety of DisplayPort compliant displays. This cable supports resolution of up to 3840 x 2160 pixels @ 60Hz. It provides you clear, crisp, and rich video with clutter free adapters and no need for drivers or software. The 20-pin Mini-DisplayPort is DisplayPort 1.2 compliant/HDCP 1.3 and 21.6 Gbps of bandwidth. Use your Rocstor premium cable Worry free which is backed by 2 Year Limited Warranty. If you have any questions about this product by Rocstor, contact us by completing and submitting the form below. If you are looking for a specif part number, please include it with your message.